Have fun and join my cookery lessons at La Mezzaluna Cooking School in this beautiful part of Northern Tuscany. Combine cooking and wine tasting and learn all the basic Italian cooking techniques and traditions la bella "Garfagnana and Serchio Valley has to offer. Courses can be an "Introduction to Tuscan Cooking" and "advanced lessons\\". We do 1 day courses and 4 Night and 7 Night Holiday Trips together with accomodation. La Mezzaluna is a Fun Cooking School and is unable to give Cerficiates for future work. Become a Chef for a day! Join my cooking lesson at La Mezzaluna and I will share with you many family recipes and traditions of this beautiful Tuscan Area "La Garfagnana and Serchio Valley\". Courses are informal and given in English and are run in the kitchen of my restaurant which I have been running with my children for almost 30 years. Course lasts 3/4 hours and we will then savour together the meal we prepared. Combine this experience with your holiday, and when you will go back home, you will impress your family and friends by making a full traditional Tuscan meal! We will make zuppa di farro, bruschetta, salsa di pomodoro, ragu. 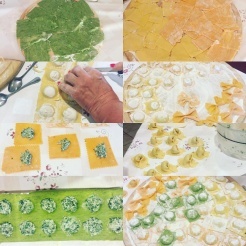 We will also make fresh pasta, either plain or coloured, followed by cheese and spinach filled ravioli. Let's finish by making a Tiramisu. Cost is €100 per person included is All ingredients Wine and soft drinks during course and meal Dinner Recipes A Mezzaluna Apron Course starts at 2.30 pm to eat about 6/ 6.30 pm.